Same. But different. And yet the same. The iPhones are masters at being that, especially the S series. What Apple obviously can't do is come up with clever names. Worse, the XS may as well go down in history as the worst labeled phone ever. Two letters but one is a Roman numeral. What could go wrong? The iPhone XS is here, like it or not. And it's the best iPhone ever made if anyone had doubts that Apple will make a worse device this year. It's the fastest, the prettiest, the sturdiest, the most luxurious, the most skilled, the most expensive. And yet, it's the same iPhone. But you can buy it in golden color now, so people could know it's different. Jokes aside, the S has always meant Speed in Apple's universe, and the iPhone XS is the bearer of the next generation Apple chip - the A12 Bionic. It's the first (available) system-on-chip made by the high-tech 7nm manufacturing process, offers a 15% faster processor and 50% faster graphics. But the highlight of the A12 is the second-gen NPU that can do 5 trillion operations per second, a massive improvement for the machine-learning scene. Apple also made some significant improvements with the main camera - there is a new sensor with bigger pixels, a new signal processor, Smart HDR, adjustable bokeh post-shooting, and stereo audio in videos! Wow! Okay, we may be going overboard with this one, but what we mean is that it's good to see Apple catch up with them Pixels. In addition to the new A12 chip and new camera, the iPhone XS also has digital video stabilization for the front camera, better stereo speakers, faster LTE, dual-SIM, better water resistance, and tougher glass panels. 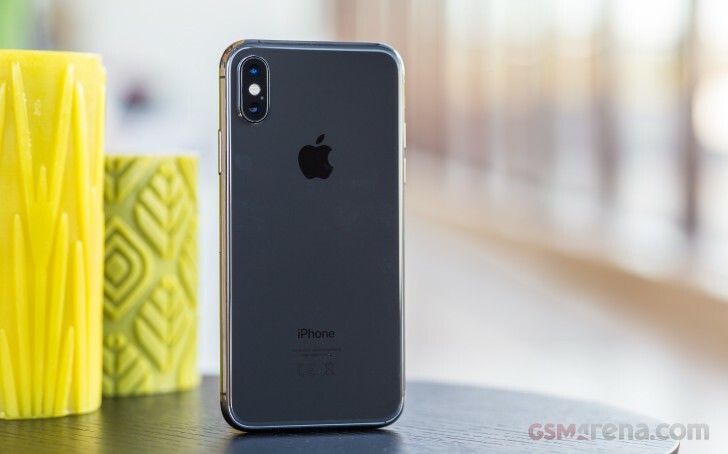 What's still the same - design and looks, the notched OLED screen, the telephoto camera, Face ID, battery capacity, and while the camera department has some new tricks, as far as numbers are concerned - it's still the same. Body: Stainless steel frame, reinforced glass front, and rear, IP68 certified for water and dust resistance. Space Gray, Gold and Silver color options. Screen: 5.8" bezel-less Super AMOLED screen of 1125 x 2436px resolution, 458ppi. HDR video support, wide color gamut. True Tone adjustment via a six-channel ambient light sensor, 3D Touch. 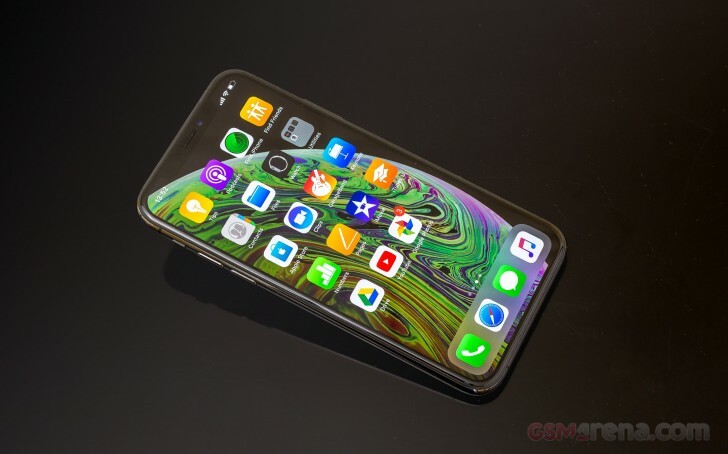 The iPhone XS has a lot to offer - with the new chipset and camera being the most advertised features. And more often than not those are not enough reasons to upgrade over the now discontinued X. And Apple probably knows it, too. But upgrading from an older iPhone has never been more tempting. 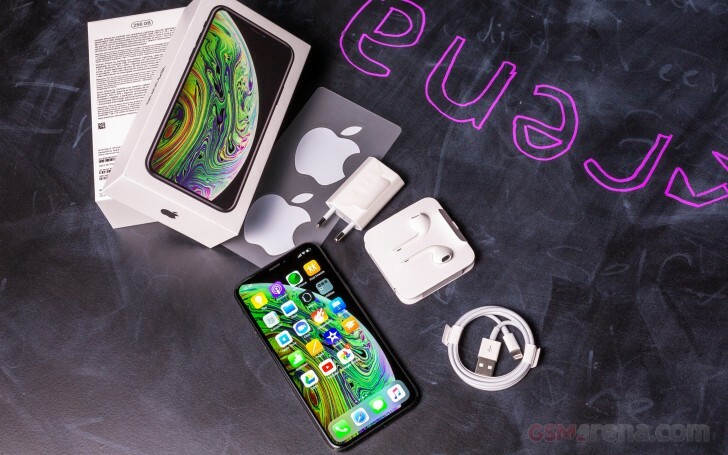 Even if the XS price is too high, there will be a little bit cheaper XR in a month. The iPhone's retail package hasn't changed much over the years, and the XS model isn't the one to break the cycle. The XS somewhat makes things worse. The iPhone XS paper box comes with Apple's favorite (and grossly underpowered) 5W charger, a Lightning cable, and a pair of EarPods. But this year Apple has decided that $1,000 (or more) can't pay for a $9 Lightning-to-3.5mm adapter in the box so if you need one, you'd have to buy it separately. C'mon! So, while Apple is going all premium and luxury with the new iPhones, their retail package is going backwards. If you want to enable fast charging - you have to buy both the $50 charger and the $20 cable from Apple. And don't forget the $9 3.5mm adapter! Or you can opt for Apple's AirPower wireless charging mat. Oh, wait, you can't. Apple failed to make that thing work - if the rumors are to be believed, it's due to overheating issues - and they've quietly scrubbed all mentions of the mat from its websites. That's surely one way to do it, but the internet will remember it forever.